In Minds on Fire, Mark Carnes shows how role-immersion games channel students’ competitive (and sometimes mischievous) impulses into transformative learning experiences. His discussion is based on interviews with scores of students and faculty who have used a pedagogy called Reacting to the Past, which features month-long games set during the French revolution, Galileo’s trial, the partition of India, and dozens of other epochal moments in disciplines ranging from art history to the sciences. These games have spread to over three hundred campuses around the world, where many of their benefits defy expectations. Students think more critically by internalizing alternative selves, and they understand the past better by filtering it through their present. Fierce competition between opposing sides leads to strong community bonds among teammates and develops speaking, writing, leadership, and problem-solving skills. Minds on Fire is a provocative critique of educational reformers who deplored role-playing pedagogies, from Plato to Dewey to Erikson. Carnes also makes an impassioned appeal for pedagogical innovation. At a time when cost-cutting legislators and trustees are increasingly drawn to online learning, Carnes focuses on how bricks-and-mortar institutions of higher education can set young minds on fire. Minds on Fire is available for purchase here. Playing to Learn provides classroom practice and research studies that verify Reacting to the Past (RTTP)—a student-centered, active learning pedagogy that provides college students and faculty unique teaching and learning opportunities—as a high impact practice for student learning and engagement. The overarching objective of this book is to collect practices and evidence from multiple disciplines and institution types regarding the efficacy of RTTP in higher education classroom settings. At its core, RTTP is a game-based pedagogy with published games on some of the most conflicted moments of human history. While RTTP is deeply grounded in theory and literature that suggests its approaches can be impactful, deep and broad examinations of RTTP pedagogies in a range of course settings have not been extensively performed until now. This book provides guidance and an evidence-base on which to build RTTP practices. Playing to Learn is available for purchase here. Professor Nicolas Proctor, currently the Chair of the Editorial Board for the Reacting Consortium, has designed or helped to design about half a dozen games.When guiding students, thinking about his own games, or offering advice to other game designers, he says that the greatest difficulty comes from balancing historical accuracy with playability. "If it's not fun, it's not a good game," he said. But Proctor's handbook asserts that fun should not be the only guiding principle, and that the first step in any game design is the clarification of learning objectives. In particular, it is important for the designer to decide why a game is the best instrument for teaching a particular set of ideas. 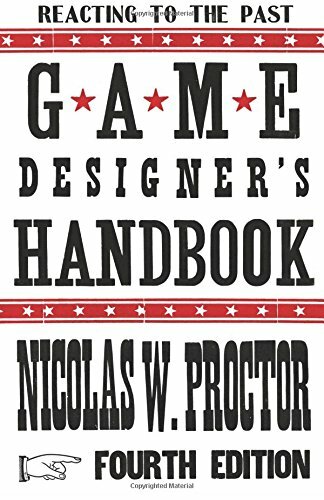 The new edition of the Game Designer’s Handbook has benefited from Professor Proctor’s research into diverse game methodologies, campus visits at a number of institutions using RTTP, and his work over the last year with dozens of authors as chair of the Editorial Board. New sections of the book discuss increasing the scalability of full-length games and the development of short games. Game Designer's Handbook is available for purchase here.